Maureen O-Hara and David Easley recently wrote an op-ed in the Financial Times titled, Financial markets are at risk of a ‘big data’ crash. Their main point was that regulators globally are not keeping up with the new risks in the marketplace, which increasingly relies on/requires more speed and data. They contend that the HFT of the last few years has been predominantly predatory on institutional traders (mutual funds, pension funds, traditional hedge funds) by increasingly relying on “strategic sequential trading”. 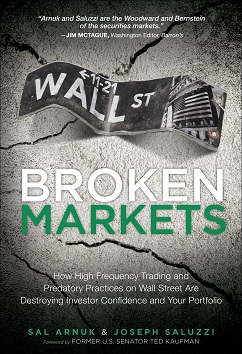 O’Hara and Easley contend that the dangers of the New HFT are more like what you may have read in the book, The Fear Index: algos searching for media that portends disaster and act upon that media. Big Data stuff. They suggest that a solution to this much more important risk of HFT is to use the services of the Lawrence Berkeley National Laboratory, where Marcos Lopez de Prado is affiliated with – a professor with whom they have co-authored papers with in the past. We add that this “strategic sequential trading” is being done by the very same HFT market makers that pretend that all they do in the market place is supply passive two-sided tight markets, earning a minute spread. We believe that the activities of “the Old HFT”- strategic sequential trading are not benign. While this predatory automated scalping has been embraced by regulators at the SEC and CFTC for tightening spreads in ORCL and BAC, we know it is a much greater cost, leakage, and tax on investors than any rogue tweet ever could be. Strategic Sequential Trading preys on the predictability of the widely-used institutional algos – including POV, VWAP, TWAP, as well as more complex ones that still use predictable engines. Stocks are systematically impacted away from an institution’s entry into the market because the stock is walked away from the institution all day long, with each child order manipulated along. The algos are manipulated not only because of their predictability, but because of the gauntlet of destinations that they all travel through. TCA that judges best execution by analyzing what portion of the spread each child order in such an algo has captured misses the big picture, which is that HFT is manipulating large institutional orders all day long systematically at a cost much greater than can be measured by any spread. Which do you think would yield buying 100,000 shares of a midcap stock at a cheaper price to investors – 1) a 5-8% POV algorithm by any brokerage firm or 2) unpredictable and manual working by a buyside trader, using his/her skills and self-initiated intraday price limits for entry points (child orders)? Have you ever had a gut feeling to pull out of an algorithm you were using? What happened to the stock a few minutes after you pulled out? Was your impact a penny or two?